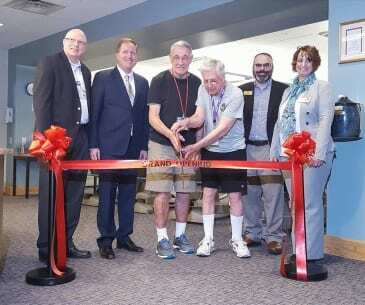 On Monday, March 19, residents of Oak Crest Village in Parkville celebrated the opening of a new fitness and aquatic center at the retirement community. The improvements were part of a $15 million renovation project at Oak Crest Village. Baltimore County Councilman David Marks commented on the importance of the project at Oak Crest Village, home to more than 2,000 residents. Chris Montcalmo, founder at NottinghamMD.com and president-elect of the Parkville Carney Business Association, also attended the ceremony. Oak Crest Village Executive Director Mark Roussey spoke, as did several residents. Oak Crest Village is a not-for-profit community managed by Erickson Living.